I Scribble my thoughts here. Sometimes even influenced by ideas and interpretations collected from the Internet. This gigantic animal, 12-metre high by 8-metre wide, lives in the largest warehouse. Massive, fully-functioning robots made from reclaimd materials are a green tech lover's dream come true. Inspired by the Sultan's Elephant, an interactive show featuring a mechanized elephant, the massive robot looks surprisingly lifelike aside from a few nuts and bolts and some joints at the trunk and legs showing. 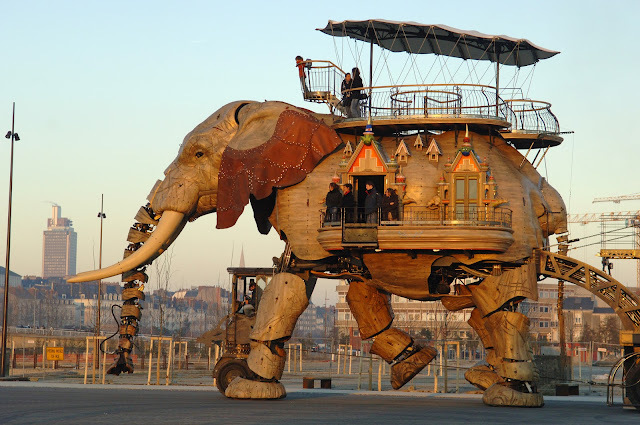 The 12-meter high x 8 meter wide elephant was pieced together using 45 tons of reclaimd wood and steel. When the majestic animal goes out for its walk, it is like architecture in motion departing a steel cathedral. The 49 passengers on board embark on an amazing journey on the Ile de Nantes. Each time the pachyderm goes out, it is a unique spectacle for everyone to enjoy. From the inside, the passengers will be able to see the moving gears that power the legs. They can make the elephant trumpet and control some its movements, thus becoming truly a part of the Machine. On the back of the Elephant, it’s like being on the 4th floor of a moving house, with a breathtaking view of the banks of the Loire River. In this time-travelling carriage, the passengers can voyage to the imaginary world of Jules Verne in the city where he was born. I don't think that you will be able to find a more impressive reclaimed robot...I dare you.